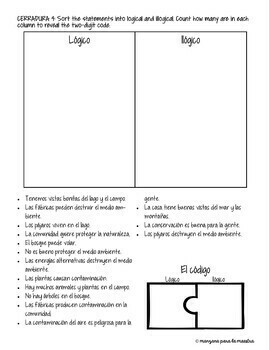 Review or even introduce el medio ambiente vocabulary with this fun cooperative learning break out room for your Spanish classroom. Perfect for Earth Day/Día de la Tierra. 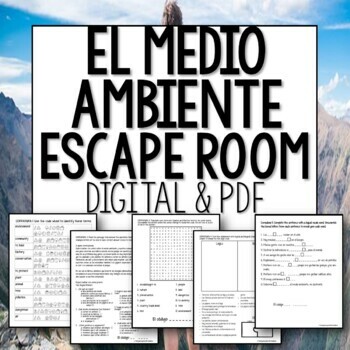 This escape room contains five puzzles to review and practice el medio ambiente environment vocabulary. First students use the code wheel to decode the vocabulary to help them read a one page letter discouraging the building of a factory. 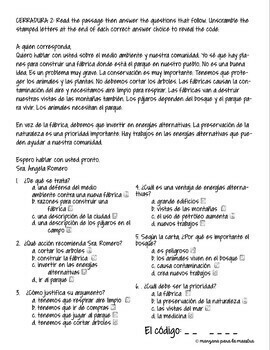 The passage uses high frequency vocabulary (compatible with your comprehensible input/CI classroom!). Students then move on to complete related puzzles - a word search/scramble, sorting logical vs. illogical, and fill in the blank with the proper terms to find the code word. The excitement keeps your students engaged and moving. This resource is unique because it does not require the additional purchase of lockboxes, locks or any other materials. Print, organize and go! 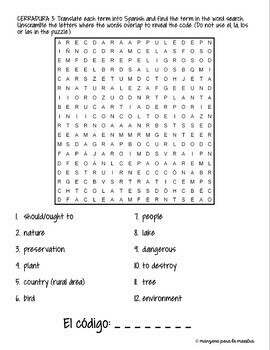 Lock 3 - Find the terms in the wordsearch. Unscramble overlapping letters to find the code. Lock 5 - Complete the sentences with the correct term. Unscramble the boxed in letters to find the final code. Download the preview file to see just how great this activity is! Please note this file is not editable. Would you like to get sales and freebies from my store? Did you know that you can earn TpT credits to save money on a future purchase? To earn, simply rate and comment on a purchased item. If there's anything I can do to help you LOVE this product, contact me!